Net Applications have published its latest data on web traffic from mobile devices, which show that Apple’s iOS took advantage of iPhone 4S launch and continuous iPad momentum to reach a 60% share of mobile web traffic. During October iOS has accounted for 61.64% of the web traffic. 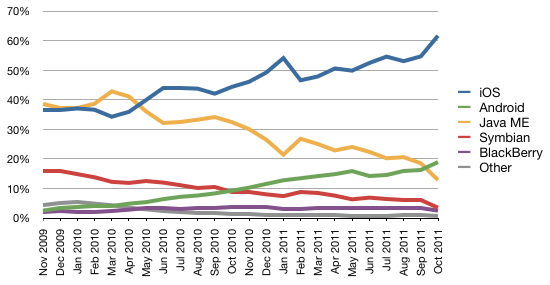 Apple’s lion’s share of the traffic comes from its strong performance on all three mobile device markets with iPad, iPhone and iPod touch. Google’s Android has also seen a strong increase that may be attributed to its growing device sales, however Android usage has mainly been limited to smartphones. On the Mac/PC front, Apple’s share of Web traffic has also continuously increased with 6.94% in October, up a percentage point and half compared to April.